Our rooms range from Deluxe Rooms which are all fitted with queen-sized beds, bar fridges, coffee and tea facilities, 6 channel TV (selected DSTV) with all the modern creature comforts and finishes, to our Standard Rooms fitted with double beds, some with bar fridges and all with 6 channel TV (selected DSTV) with coffee and tea facilities. We also offer Family Rooms which can be Deluxe or Standard. These rooms consist of two double beds. 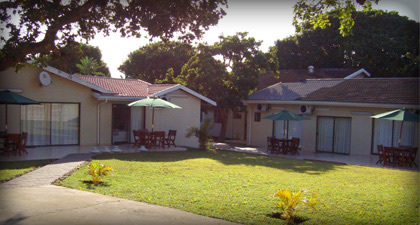 All our rooms are en-suite and fully air-conditioned. We offer bed and breakfast as well as bed only accommodation. Our chef Absalom is always at the ready with a wooden spoon in hand and a smile on his face and once you’ve seen the Continental breakfast spread he lays out, you’ll be wanting to start your day with a full tummy. Dinner is prepared daily by our chef, but reservations are essential. We cater for all special dietary requirements. Your hosts Kerry-Anne Youlley and Pretty Mlondo welcome you into our “home” that will soon become your “home away from home”.